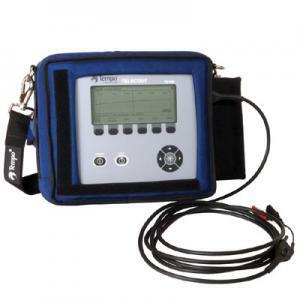 Tempo TelScout TS100-01 Cable Fault Locator is designed for ease-of-use. You'll spend less time operating the TDR, and more time repairing faults. Simply select the cable type to be tested and the TS100-01 does the rest. On the performance side, the TS100-01 employs optimised pulsing and sampling coupled with advanced filtering and signal processing techniques to insure the maximum measurement range. That way, you'll always have a clean waveform for easier fault interpretation. The short pulse Option 01 provides a 5 ns pulse width for close-in resolution. Faults as near as 3 ft. from the pedestal can be located with ease. Option 01 also includes a coaxial cable setup menu and an adapter cable. This enables you to locate faults in coaxial cables used in today's emerging broadband systems.